Hometown Pizza Of Adrian serves our customers from 2 delivery and carry out pizzerias in Adrian, MI. Hometown Pizza Of Adrian Welcomes You! Does your stomach start rumbling at the mere mention of pizza? 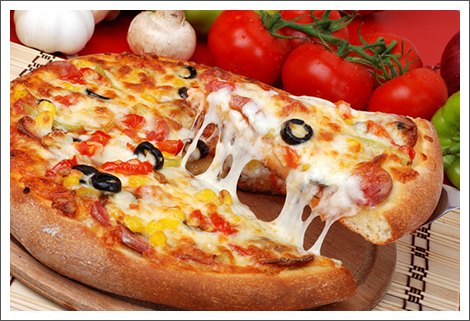 Is it your turn to arrange for the “pizza night with friends” this Friday? Whatever your reasons to order a pizza, don’t ever settle for inferior quality when a pizza craving hits you! Make a call to Hometown Pizza Of Adrian to taste the best, hot and satisfying slice or pie in Adrian, MI. We serve our customers from 2 delivery and carry-out pizzerias: Hometown Pizza at Midway Market and Hometown at Clark’s Corner. We use the finest ingredients including first-rated mozzarella, tangy sauces, fresh local produce and excellent meats to create the highest quality fare. Satisfy your taste buds with our zesty hot wings, try our flavorful Hawaiian pizzas and our legendary submarine sandwiches or go vegetarian with our veggie pizzas. Stop by any one of our 2 locations today or call for a delivery. Copyright © 2014 Hometown Pizza Of Adrian. All rights reserved.